I have written before about our preparations for potty training, and these have been underway for a while now. We are taking it very slowly and steadily, and letting Max take the lead. He isn’t quite ready for pants yet, but he is definitely showing a real interest now, especially at nursery where some of his friends are now using the potty or toilet – I think this is a great environment for encouraging children. Over the festive period it can be really easy to let things slip, but if you are potty training you need to try and keep things as normal as possible, and so I have popped together a list of things that can help maintain potty training at this time of year. Don’t take a step backwards. It can be really tempting to put nappies back on when you are backwards and forwards between relatives houses, or hitting the Christmas crowds to finish the shopping, but doing this can cause more problems. Your child may become confused, and revert back to using nappies on a full time basis. If you are out and about make sure you pack a portable potty, plenty of spare pants and trousers and some wipes for cleaning up accidents. If accidents do happen, stay calm, deal with it and move on, reminding your child that they can use the potty or toilet now. Pack sensibly. If you are staying with family over Christmas, make sure you pack all the things your child needs to feel comfortable. Take their own potty or toilet seat, lots of pants and clothes and anything else you use for potty training at home, such as a special book to read on the potty or a sticker reward chart. Keep it as normal as you can. Make sure others are on board. Brief friends and relatives on your toddlers routine, so if you aren’t around they know what to expect and can help your child to continue with their potty training journey. Accept there will be more accidents. Christmas is a busy and super exciting time, so accept that accidents will happen when your child is distracted by new toys and new faces. Accept that this is a temporary setback, and don’t feel like you, or they, are doing anything wrong. Have a stash of HUGGIES® Pull-Ups® . They are specifically designed to help make potty training easier with the new Learning Liner inside Huggies® Pull-Ups allowing toddlers to feel wetness for a few moments, before quickly drawing the moisture away. That way they learn the difference between wet and dry and can ultimately stay dry on their own. HUGGIES® Pull-Ups® are the perfect tool for potty training, especially at such a busy time of year! We have been using them for a few months now, and Max loves the fun designs. They are a great step between nappies and pants if you are not sure your little one is quite ready yet. 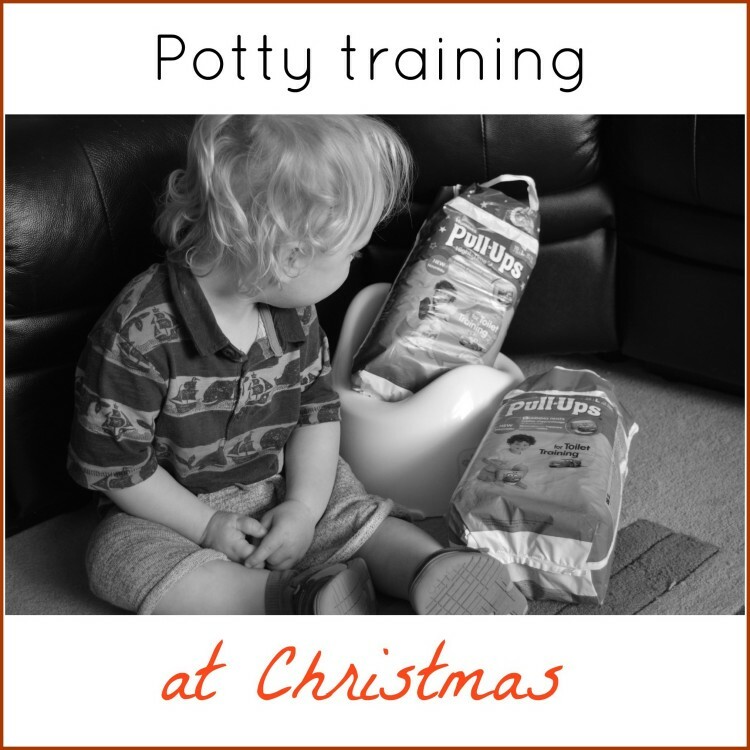 Have you experienced a Christmas with a potty training toddler? How was it for you? Elaine @ Entertaining Elliot recently posted…Baby Moo’s Baby & Toddler Clothing – New Bournemouth Store! I think poos are always harder to crack – it took us a long time after Jacob was dry to get that sorted! There’s a great book by Penwizard, you can personalise it with your little ones name, and we have found that really helpful so far. Good luck, hope it goes well this time! We are planning to potty train our then 3 year and 4 months old boy at Christmas this year. He is not a fan of having nappies off. So more than likely we have to go the route of putting pants on him straight away and whenever he feels it is wet he will have to use the potty. I have no idea how to get this through to him but we have 2 weeks to try this at Christmas because mammy and daddy are off that time. Also the dodie will be given to Santa too. Difficult time. I am dreading it lol Any advice welcome. I think huggies will have them confused because it is still a nappy in the end.